pronunciation, and much more. The author takes to task such take-no-prisoners grammarians as the well-known Lynn Truss (whose Eats, Shoots, and Leaves was a giant bestseller), arguing that we should say no to zero-tolerance prescriptive rules. Indeed, as one of the world's leading authorities on the English language, Crystal offers an original and authoritative counter-argument to the prescriptive agenda. He shows for instance that context is very important, that the dangling participle "driving in from the airport" is not wrong because the context makes the meaning clear. Moreover, even the hope for a standard system of spelling is in vain, since approximately 25 per cent of the words in a standard dictionary have more than one spelling (such as dark room and dark-room and darkroom). 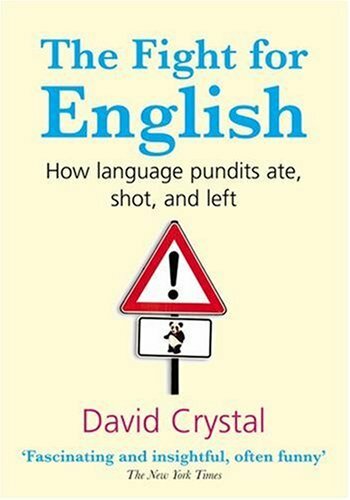 Hailed in The New York Times Book Review as "fascinating and insightful, often funny," The Fight for English is a welcome breath of fresh air in the often stultifying debate over English usage.